Dear friend, the field is ripe unto the harvest, but the laborers are few. Your prayers cause men, women, and young people to encounter the love of Jesus and enter the Kingdom of God. Together, let’s “storm the gates” and bring in the end-time harvest of souls! A harvest of souls won through weekly evangelistic efforts as well as through the Storming the Gates Crusades. The sick to be healed through the weekly hospital outreaches. Prisoners to encounter the love of Christ through the weekly prison outreach. For students to grow in their walk with God. For students to increase in the anointing with signs and wonders following the Word of God. For students to receive financial favor to pay their school fees. 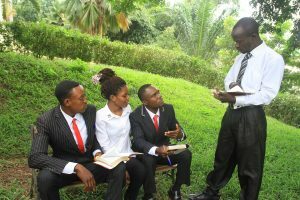 For lecturers to teach under the anointing of the Holy Spirit as they impart God’s Word into the lives of the students. For the Alumni to be used by God to cause Kingdom expansion wherever they are established. Finances to complete the multi-purpose classroom building.